1. What does a shepherd take care of? 2. Does a good shepherd lay down his life for the sheep? 4. What does a hired hand do when he or she sees the wolf coming? 5. What happens to a flock of sheep if there is no shepherd? 6. In our Bible story, does the good shepherd know his sheep? 7. Do the sheep know the good shepherd? 8. How are we like sheep? 9. Do we have a good shepherd? 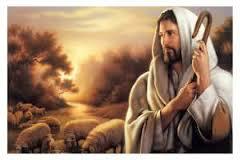 Who is our Good Shepherd?